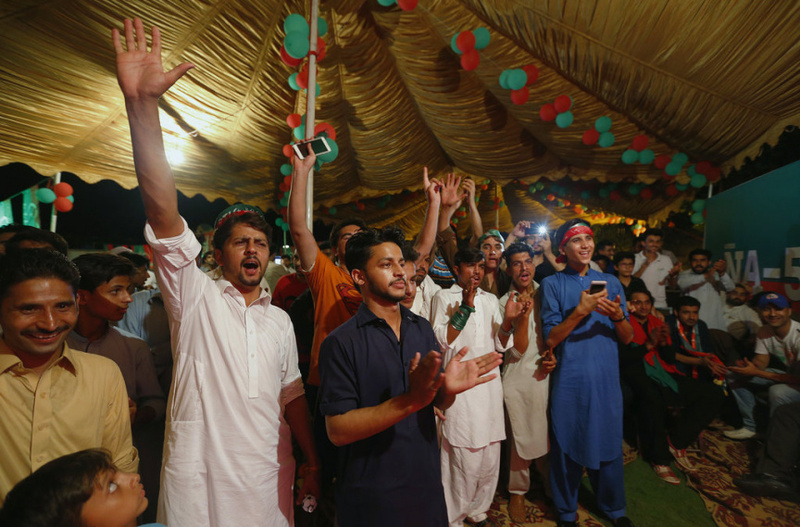 ISLAMABAD (AP) — Pakistan's cricket star turned politician Imran Khan declared victory Thursday for his party in the country's general elections, promising a "new" Pakistan following a vote that was marred by allegations of fraud and militant violence. Khan, who aspires to be the country's next prime minister, said in a televised address to the nation that "thanks to God, we won and we were successful." "If God wills, we will set an example," he added. Pakistan's election commission has not yet released official, final results but Khan has maintained a commanding lead according to projections by many television stations, though it's unclear if his Tehreek-e-Insaf party, or PTI, would get a simple majority or have to form a coalition govrnment. More than a dozen TV channels in Pakistan, based on official but partial counts, were projecting — using their own, undisclosed methodologies — that Khan's Pakistan Tehreek-e-Insaf party is getting as many as 119 seats of the 270 National Assembly seats that were contested. In a tweet on his official account, Pakistan's military spokesman Gen. Asif Ghafoor called accusations of interference "malicious propaganda."